A treatment that gets to work instantly on reducing the problem of flaky scalps. Its specially designed formula works on dry type dandruff and the often associated excess oiliness. 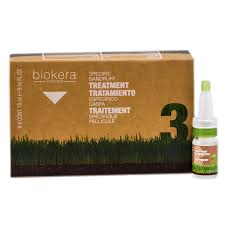 Biokera specific exfoliating shampoo. Then make separations just as if you were applying hair color. From ear to ear and from the nape of the neck to the forehead. Spread the contents of the vial evenly all over the scalp then massage in gently with your fingertips. Do not rub. Do not rinse.